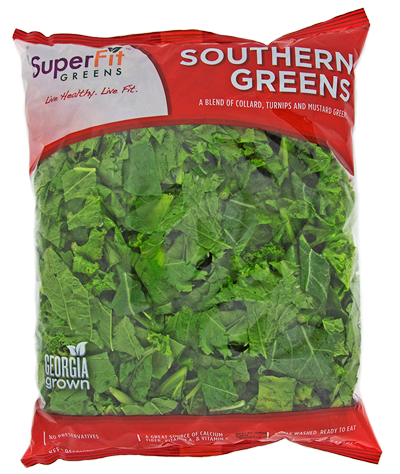 SuperFit Southern Greens are a blend of collards, turnips, and mustard greens bringing together all of the distinct flavors and supreme nutrition provided by this leafy trio. Chock-full of vitamins and minerals, this mixture of traditional greens will truly be the superfood at any meal. If you’re used to cooking collards or turnip greens with ham, boost your nutritional value and flavor profile by including kale! Do you usually just add kale and spinach to your salads or smoothies? Make room for an exciting addition and add collards and turnips! Sure to be a staple in your meal-planning, Southern Greens is here for your health and here for your taste buds! © Copyright 2017 SuperFit Greens. All rights reserved.